The Nachtmann Vivendi stemware line is a welcome blend of elegance and accessibility, making it a perfect choice for everything from a weeknight dinner to a stylish cocktail party. 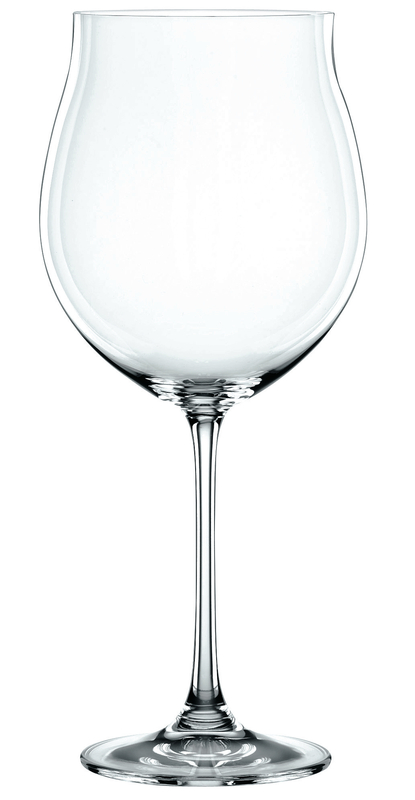 Created by renowned crystal company Riedel Glassworks in Bavaria, the glasses feature classic European silhouettes and a platinum finishing process for durability and shine. Lovely elongated stems distinguish the wine and champagne pieces, while subtle curves add understated flair to the beverage glasses. With its impressive sizing and tulip profile, the Vivendi XXL Burgundy glass is perfectly suited to pinot noir, Nebbiolo, Barbaresco, Barolo, and red Burgundy wines. Packaged here in a set of four burgundy /Pinot glasses, each glass holds a generous 30-1/4 ounces and should be washed by hand for best care. See Vivendi's white wine, champagne, and Bordeaux glasses for coordinating stems and the tall drink, water / pilsner and double old fashioned tumblers for matching barware. Vivendi decanters are also available.